Encapsulation transformation. 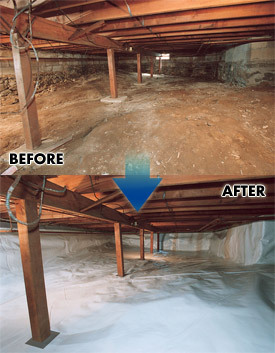 A damp, dirt-floored crawl space is a liability to home energy performance, indoor air quality and building durability. The encapsulation process utilizes special waterproofing, air-sealing and insulating products to eliminate these problems. Many houses that have basement and/or crawl space foundations aren’t adequately or correctly insulated. The reason for this is simple. For many years, the insulating strategy that builders used in basements and crawl spaces called for fiberglass batts to be installed between floor joists in basement and crawl space areas. Today, we know that this approach causes problems that impact energy efficiency, indoor air quality and even building longevity. Builders got into the habit of using fiberglass insulation in below-grade applications because of its widespread availability and low cost. But it doesn’t take long for the moist conditions in a basement or crawl space to cause problems with fiberglass batt insulation. When batts absorb moisture, they lose their insulating value, compress, grow heavy from water weight, and often fall out of place. Fiberglass batts also promote the growth of mold, especially if they have a paper facing. Mold not only creates a health hazard by putting mold spores into the interior air; it also can cause wood to rot, eventually leading to structural damage. Fortunately, there’s a type of insulation that can do all the things that fiberglass can’t in below-grade applications. Rigid foam insulation won’t absorb moisture, lose R-value, support mold growth, compress or fall out of place. In basements and crawl spaces, rigid foam insulation is usually installed against the foundation wall. By changing the location of the insulation, the basement or crawl space can be brought inside the building envelope, which improves overall home energy performance. Unlike fiberglass, rigid foam insulation can provide a very effective air barrier when joints between foam panels are sealed and taped. This type of installation, combined with air-sealing the perimeter of the foundation at the rim joist, is what building scientists recommend. The result is greater energy savings and greater mold resistance as well as improved indoor air quality. NOTE: If a crawl space has a dirt floor, building scientists recommend crawl space “encapsulation:” closing up foundation vents, insulating foundation walls with rigid foam, and sealing over the dirt floor with a durable plastic membrane.